Reese's Chocolate Chip Cookie Bites! You only need TWO ingredients and they take 15 minutes start to finish. World's easiest dessert! 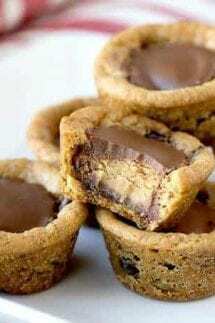 As soon as you pull them out, place one Reese's Peanut Butter Cup in the middle of the cookie.